She was fortunate, though, because the commissioner spent time with her explaining about water and how the water commission worked. His taking the time to do that helped ensure the accuracy of her reporting. Today she is the Communications Practice Director for Jacobs Engineering with more than 25 years of experience implementing strategic communications programs. Along the way, she’s learned some ways to help other reporters, which she shared during the 2014 NFPW conference in Greenville, S.C.
Find the sizzle in the technical stories. If it’s too technical, audiences won’t be interested, which means reporters won’t be interested. Avoid jargon. This goes without saying. Break down the challenging concepts. Taking the time to do this leads to more accurate and interesting stories. Provide a list of acronyms. These are also good to share internally so there is no confusion. Think of visuals. Cole noted that sometimes spending time with a photographer or videographer to get the right shot may be your only opportunity to tell your story, so use the time wisely. And if all of those techniques fail, Cole reminded the audience that most of us now have resources at our disposal for telling our stories. A company website and social media platforms immediately come to mind, but she also encouraged the use of community events. For example, Spartanburg, S.C., has held a Paddle Fest the past three years as a way to help connect the community to its reservoirs and increase the stewardship of water resources. Five years ago and more than 500 posts later, I’m still writing Cynthia’s Communique. It’s a labor of love, and one that I started when I was elected president of the National Federation of Press Women. The blog goal was simple – to engage with NFPW members and start a conversation. Readers have commented on the blog, liked it on Facebook or read it on LinkedIn. Now they can even learn about it through my Twitter account. When I grow weary of researching and writing and when I think I should quit, a reader will tell me how much she enjoys it or what he has learned from it. And that keeps me going. Those just starting their careers in communications. I tell people my blog is about communicating in today’s frantic world so I focus on communications, leadership and balance. As for what’s next, I will continue the blog, at least for now. In 2015, I will most likely scale back to once a week because I’m going to see what happens when I take the best of my blog posts and create a book. That means you will probably see some blog posts about how to publish a book. When I succeed in publishing the book, I also will need to market it, which will bring about another series of blog posts, and my need to create a website. For the foreseeable future, I’m not going anywhere. I hope you as my readers will continue the journey with me. She has to be if she is going to pay the mortgage. She has cobbled together a series of positions to do just that. She has worked as a morning radio show host, a keynote speaker, a sideline reporter, a TV host and even a commercial spokesperson. She also owns a clothing boutique. Those positions came from her passions – speaking and giving back. As a preacher’s kid, Tiffany listened to her dad in the pulpit and came to understand how to use words to move people. She also was active with the Miss America organization where she learned the value of community service and further enhanced her public speaking skills. She followed a fairly traditional path except that instead of working in broadcast journalism she went into public relations and marketing. She oversaw marketing for a hospital. During that time she worked for three CEOs in four years. Tiffany decided it was time for a change. Along the way, she has learned that sometimes she has to make difficult decisions. “You have got to be doing things that give you forward progress,” she said. For her that meant giving up a radio show that required a long commute that cut into other opportunities. 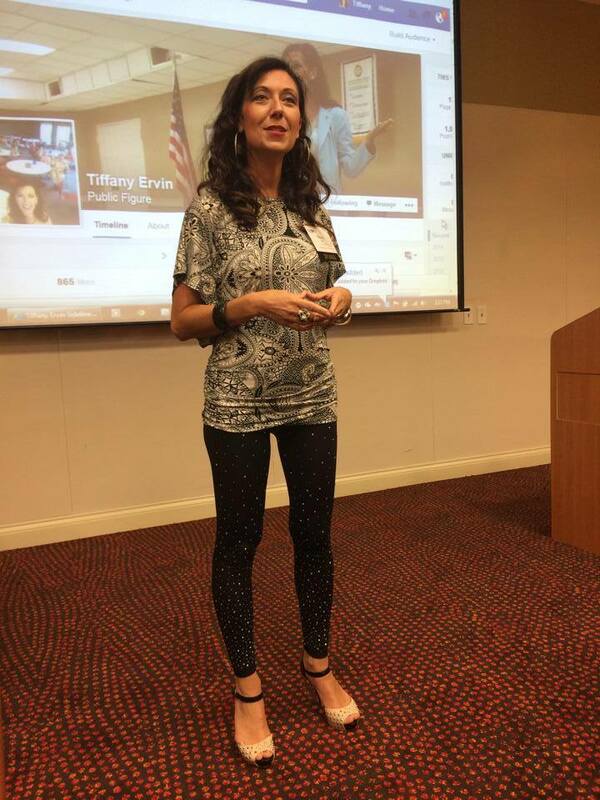 Once you know what you want to do, Tiffany encouraged audience members to network and use social media, both of which involve building relationships. “Social media is an opportunity to network with people who may be looking for you, and you didn’t even know it,” she said. Tiffany uses social media to share short clips from her speeches. “It’s great for when someone wants a sample of my work,” she said. Facebook is good for demonstrating the breadth of what she offers. She finds Twitter helpful for meeting people in the long-term. At the end of the day, when she has finished all of her jobs, she also knows she has paid the mortgage. In today’s fast-paced social media world, you may never be contacted about a media crisis, even if it’s your responsibility to handle a crisis. Too often, reporters, get their information directly from social media. By the time you learn of the event, it may have been streaming for hours. Develop a relationship with the media so they actually trust what you are saying. Provide context and give them something they can use. Follow the news on social media and update your own channels with relevant and timely information. That’s what the Boston Police Department did during the Boston Marathon bombing. Work with what is happening. A crisis plan is great to have, but it’s not always valuable in the midst of a situation. Develop a counter story and share it with the media. Identify individuals who are supportive who could respond on social media sites, including reaching out to reporters. If you work in media relations, a great deal of your time is probably spent drafting messages that may never see the light of day. That doesn’t mean that the work isn’t important. These statements are important to have at the ready, and executives most likely will feel more comfortable knowing that a statement exists about a potential situation. Why did it happen? Or why did the company respond to the incident the way it did? How is the company resolving the issue? Once you have the message drafted, it’s important to prepare FAQs to expand on the points and also answer questions that your company may not want to proactively discuss but that may be asked by the media, employees or stakeholders. By already having answers at the ready, the company won’t look as if it is unaware or trying to hide information. Having messages at the ready is the first step in a well-executed crisis communications plan. I attended a conference in June that had a cool app. The Guidebook app allowed conference participants to review the schedule from their phone, read bios of the speakers and connect with participants. 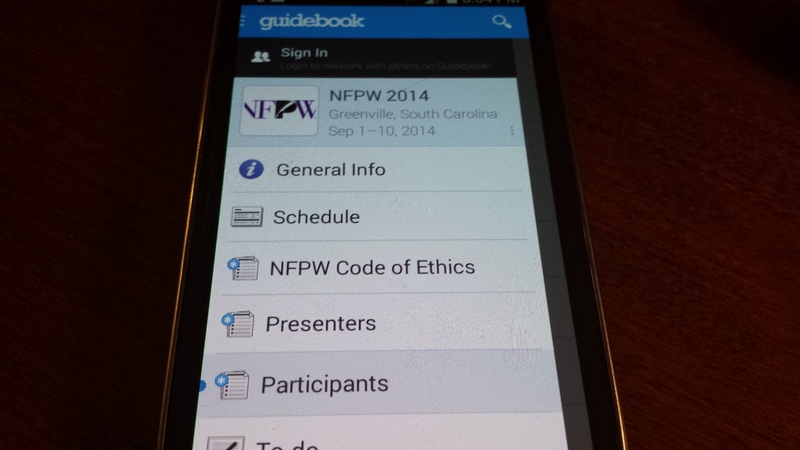 I was so impressed with the app, I wanted to use it for the NFPW conference. NFPW is an organization in which I am actively involved, although I was not involved in the planning of this year’s conference (whew!). I knew this year’s conference planners already had plenty on their plates so I reached out and asked if they were interested in the app if I created it for them. Of course, they said yes. I spoke with Guidebook and found out that because our conference wasn’t that large, there would not be a cost to use the app. The downside is that I would not be able to get technical assistance, but I was assured it was intuitive. How hard could it be? It was worth the time to create it because it meant participants at the NFPW conference would have conference details at their fingertips. Today almost everyone carries a smartphone with them. 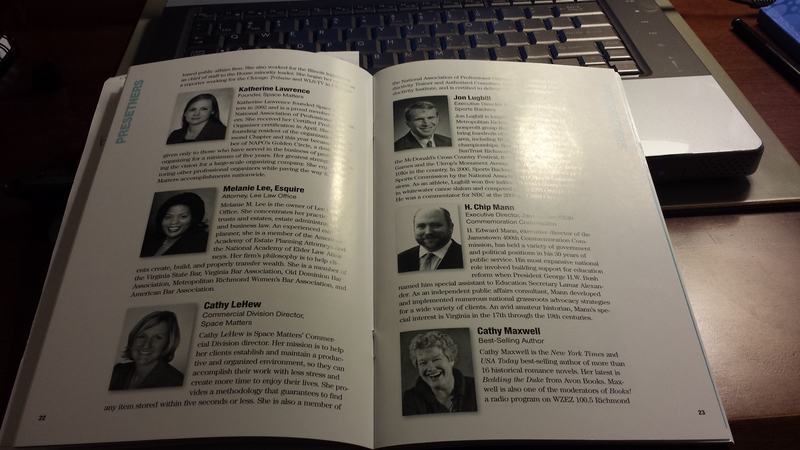 Keeping track of a conference program can be a challenge. And I developed some new skills. I had a few challenges, but I persevered. It was a good learning experience, and conference attendees used the app. Another example is a presentation given at the conference on useful apps. One way to learn is to learn from others. The session highlighted useful apps and then participants shared their favorites. By the time the session ended, we had a list of about 25 additional recommended apps. Another great place to grow your skills is Lynda.com. This site provides web tutorials on hundreds of topics. You can subscribe for a month or a year. I subscribe for a month when I realize I need to learn about a specific topic. I spend a few hours learning through the site. Another site to check out is Online Media Campus, which is a partnership of the Southern Newspaper Publishers Association, the Iowa Newspaper Foundation and press associations throughout the United States and Canada. It provides high-quality, low-cost online training to media professionals. Have you ever been asked to write a bio, whether as a member milestone or as a speaker? It’s an opportunity to brand yourself and share your uniqueness. Too often, however, people simply include their name, professional highlights and education without making themselves stand out. Identify yourself. Tell the reader who you are and what you do. It also helps to share a bit of your personality, such as a hobby or your community service. I usually include something about traveling or mysteries in my bios, for example. Share your story. Readers connect with stories so tell yours. Did you overcome an obstacle? Did an experience move you to start a business? Use a conversational tone. Pretend you are telling your story to a colleague and then write it that way. Skip the big words that may come across as if you are showing off.